The Wedgwood neighborhood does not have any Victorian houses built in the 1800s, but there is one house, completed in 2007, built in the Queen Anne style which was popular more than a century ago in Seattle. Queen Anne ruled England, Scotland and Ireland in the early 1700s. In the 1850s in England, architect Richard Norman Shaw used the term Queen Anne as a tribute to her reign, as she had encouraged the arts. The term Victorian signifies the 1800s during the reign of Queen Victoria, and one of the architectural styles in the Victorian category is Queen Anne. Shaw’s Queen Anne style was highly decorative, and the style became even more elaborate as it migrated to the United States. 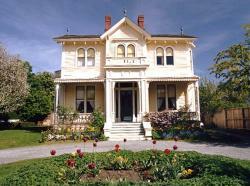 Chief characteristics of the Queen Anne style are the shape and the decoration of the house. In shape, there is the avoidance of flat surfaces, so that the house may have many varying fronts such as projecting porches, gables, towers and bay windows. A Queen Anne house will have decorative detailing such as spindlework. Also called gingerbread, spindlework may consist of delicate turned porch supports, a lacy wood frieze at the point of a gable or knob-like beading. Such details are sometimes called “Eastlake” for the name of the furniture maker who first used them as applied decorations on houses. Considered an artistic, expressive and romantic architectural style, it would seem unlikely that an unmarried civil engineer would indulge a fancy to build a Queen Anne house, yet Wedgwood’s Queen Anne house at 3056 NE 87th Street is the legacy of just such a man, Joseph Robert Miller (1946-2005). As a child a love of the wilderness was planted in Joe Miller’s heart through time spent in a family cabin at Crystal Mountain. As an adult Joe traveled widely to experience wilderness areas in Washington State, the Yukon and Yellowstone, doing camping, hiking and canoeing. The Crystal Mountain cabin had served as a family gathering place and when the cabin was no longer in family ownership, Joe Miller longed for another place where everyone could come. In 1991 Joe bought property at the northwest corner of NE 87th Street and 32nd Ave NE, adjacent to his brother James’ house in Wedgwood. Joe lived in a small house no bigger than a garage on the back of the property while building his dream house at the front of the lot. The Emily Carr House in Victoria, B.C. Taking inspiration from the Emily Carr Museum House in Victoria, B.C., Joe designed his new house as a replica. Emily Carr (1871-1945) was a Canadian artist and writer whose works are revered as part of Canadian national identity and heritage. The Carr family home has been turned into a historic site with an interpretive center dedicated to her life, art and writings. Emily Carr made extensive trips to remote villages to record the life of First Nations peoples in paintings, and she is considered the first real Canadian artist. Joe Miller must have admired and understood Emily Carr’s appreciation for wilderness areas and the lifestyle of native peoples who lived in harmony with nature. Emily Carr’s house also represented the importance of family, which was an important value to Joe Miller. Like Joe Miller, Emily Carr was a single person who remained close to her family all of her life, with a big house as a central gathering place. Emily Carr’s house was handed down as a legacy to the Canadian nation. Building his own Emily Carr house was a hobby and Joe wasn’t concerned about finishing it within a certain time; the process was the important part. Joe built the house at a meticulous pace, expressing his love of craftsmanship and detail. Over the years beginning in 1991 when Joe started the project, Wedgwood neighbors thought of it as the “unfinished house,” but to Joe, it was the Handcrafted House. In summers Joe hired his nephew Peter to work on the house with him, doing jobs which one person couldn’t do alone. Joe continued to take trips to the wilderness and his untimely death came in 2005 in a canoeing accident on Lewis Lake in Yellowstone. After Uncle Joe’s death, Peter Miller worked to finish the house and moved in with his young family in 2007. The Milller house is the only Victorian/Queen Anne-style house in Wedgwood. The Miller house is characteristically Queen Anne in its shape which uses a wide front veranda, a projecting upper window and gable, dormers, and side polygonal bays to break up the surface so that there are few flat areas on the house. The Miller house has restrained decoration – no elaborate Victorian spindlework – but it does have Palladian (round-topped) windows on the front-facing second floor and dormers. Palladian windows, often used on Queen Anne houses in the Free Classic category, are references to the Venetian architect Andrea Palladio (1508-1580). Palladio’s work was based upon classical temple architecture of the Greeks and Romans, including symmetry and proportion. 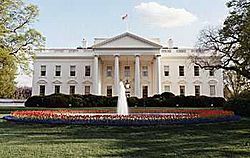 The White House was constructed upon Palladian architectural principles of symmetry and proportion, referencing classical Greek temples. Palladianism became very popular during the American revolutionary period of the 1770s as the style harkened to the values of Greek democracy. Thomas Jefferson’s house, Monticello, and the White House itself were constructed on Palladian architectural principles. In his replica of the Emily Carr house, Joe Miller included its symmetrical form, front projecting gable, and second-story Palladian windows. Joe Miller’s Handcrafted House expresses the warm memories of Uncle Joe’s craftsmanship and love of beauty. 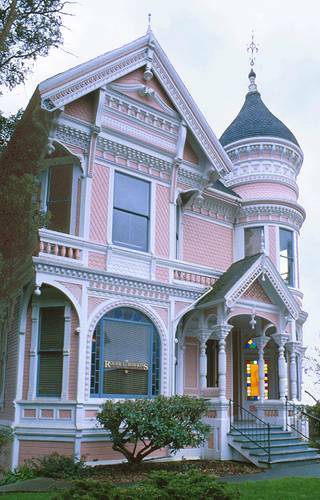 The Miller house is unique as Wedgwood’s only Victorian-Queen Anne-style house. Emily Carr House info, Victoria, British Columbia. A Field Guide to American Houses, Virginia & Lee McAlester, 1992. HistoryLink Essay #3414, Seattle Neighborhoods: Queen Anne Hill – Thumbnail History, by David Wilma, June 28, 2001. Interview with Peter Miller, November 11, 2007. 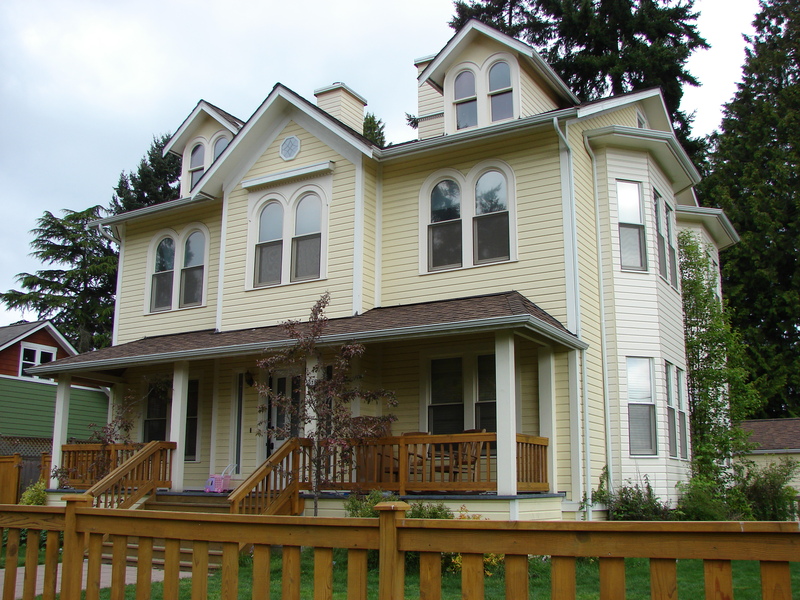 This entry was posted in 3056 NE 87th Street, Architecture, Houses and tagged Queen Anne style. Bookmark the permalink.